What it is: Involving CNAs in care planning means having them as true members of the care team, so that their day-to-day information routinely updates the care plan, and they join in determining the most effective course of action (for implementation guidance and how-to’s, please visit Pioneer Network’s web-based Starter Toolkit and newly released Implementation Handbook for Engaging Staff in Individualizing Care). Why it is important: CNAs have up-to-date information about residents, know likes, dislikes and customary routines, and can share details of residents’ day-to-day life and activities that families want to hear about at care plan meetings. Residents and families have such strong relationships with and trust in consistently assigned CNAs, that CNAs’ presence makes residents and families more comfortable in the care plan meetings. 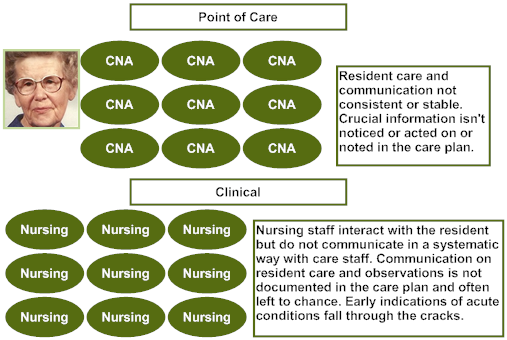 How did CNA involvement in care planning help Mary? 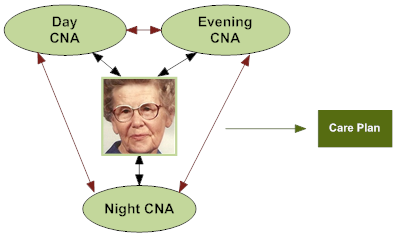 What might happen WITHOUT CNAs involved in care planning for Mary? All of the critical information that CNAs readily know about Mary is not integrated with clinical information in her care plan. These details then cannot be used proactively or even in response to an incident (e.g., fall), behavioral expression, or clinical concern. As a result, Mary has been given antipsychotics because causes of, and effective responses to, her distress are not consistently known, shared, and used. Mary is falling now because of the sedative effect of antipsychotic medications. Even with the medications, she is still distressed by staff efforts to redirect her at night and wake her too early in the morning. Clinicians treat her deteriorating condition without realizing that they have caused it by not honoring her customary routines.